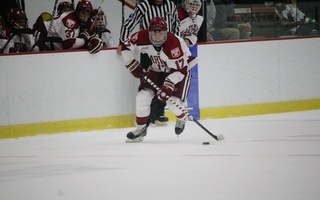 Men's hockey picked up a point in a tie against ECAC rival Quinnipiac. The game looked to be over. 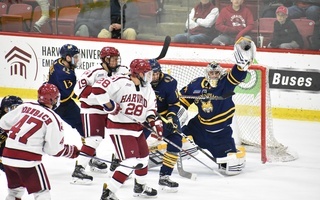 The Harvard men's hockey team, facing one of the top backlines in the nation in Quinnipiac, found itself down 2-1 with less than a minute left. But the Crimson (5-7-3, 2-6-3 ECAC), with the extra attacker inserted in the game, was able to tie it up with just 49 seconds remaining in Tuesday night's ECAC contest at the Bright-Landry Hockey Center. Junior Patrick McNally passed the puck up to freshman Alexander Kerfoot who then threw it towards the net while streaking down the across blue line. Sophomore Kyle Criscuolo was able to win the battle down low and send the puck back across the baseline to the goal. Bobcat goalie Michael Garteig made the initial save, but Kerfoot was able to punch it back in to knot the score at two. The score would remain tied the rest of the way despite an eventful overtime period, in which a hard shot by sophomore Brian Hart clanged off the crossbar and senior goalie Raphael Girard made three of his 29 saves as Harvard skated to a draw against No. 8 Quinnipiac (15-3-5, 6-2-3 ECAC). “It was a tough start for us but we battled back and we found away to squeak out a point there,” Kerfoot added. Harvard enterred the contest off its highest scoring game this season with seven goals against BU and a nine-goal outburst in a exhibition match against the Russian Red Stars the game before. It would take the strong Bobcat defense – who entered the game allowing a nation-low 1.82 goals per game – to neutralize the Crimson's offense, holding the team to 22 shots for the game. Quinnipiac's nation-leading penalty-kill also slowed down Harvard, with the Bobcats now improving to a 92.2% kill rate with an 0-4 shutout of the Crimson's power play. Harvard also shutout Quinnipiac on the power play, 0-4, improving to an 86.2% kill rate, good for eighth in the country. 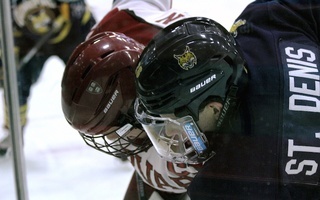 The Bobcats struck first with a goal by senior forward Kellen Jones, as he netted a wrist shot from the right circle skating down the ice after a feed from freshman forward Sam Anas. Both Jones and Anas lead the team in points, now with 27 each on the season. The Crimson knotted the score at one midway through the second period. 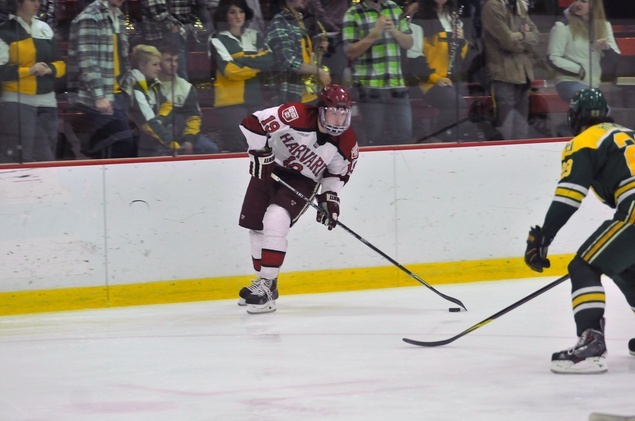 After receiving a pass from Kerfoot, junior Max Everson deked a Quinnipiac defender with a toe drag before feeding it to Criscuolo, who was then able to fire a shot from the left circle past Garteig. But the Bobcats were able to jump out to a lead quickly in the third period, as Matthew Peca beat Girard stick-side with a wrist shot from the left side as he skated down the left side after a pass from Connor Clifton. The game would remain scoreless until the tying goal by Kerfoot, who picked up his eighth point in his last four games. Harvard was able to take some of this late game momentum into the extra period, but Quinnipiac had a few chances early on in overtime. Hart responded with his shot that was reviewed by the officials but eventually ruled no goal. The Crimson will look to keep these good signs going over the next month, with five straight games after Tuesday against ECAC rivals, starting on Saturday night against reigning NCAA champ Yale at Madison Square Garden.